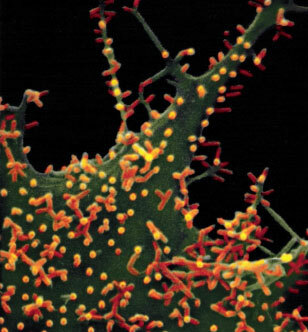 Particles of the RNA virus vesicular stomatitis virus (VSV) on tissue culture cell. New research shows that with more time, viruses have the luxury to infect the old host while exploring adaptive tweaks to infect a new host. How viruses like Ebola, influenza or even the common cold adapt is a question that affects the health of everyone on earth. A new Yale University study reveals that gradual exposure to new host species leads to major genetic changes in these pathogens — and possibly makes them more dangerous. In environments marked by more gradual change, the molecular alterations are more like “tweaks, as if the virus is keeping its options open,” said Yale’s Paul Turner, professor of ecology, evolutionary biology and co-author of the research published online February 1 in the journal Evolution. Turner and colleague Valerie J. Morley subjected RNA viruses — a group that includes flu and cold bugs as well as more dangerous pathogens that cause Ebola fever and SARs — to novel hosts either quickly or gradually. They then measured genetic changes to the virus. The major changes found after the gradual introduction of novel hosts, such as humans who move into a deforested and previously uninhabited area, might help explain higher virulence of emerging diseases such as Ebola, which move from animals to humans, said the researchers. “With more time, viruses have the luxury to infect the old host while exploring adaptive tweaks to infect a new host,” Turner said. Although both sudden and gradual host changes can lead to virulent pathogens, the gradual exposure to new hosts seems to allow a greater opportunity for high-virulence genetic changes, the study found. Be the first to comment on "Yale Study Shows Gradual Environmental Change is an Ally to Viral Pathogens"